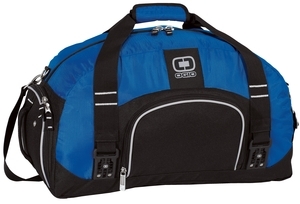 The OGIO – Big Dome Duffel Style 108087 is available to purchase in your choice of the following colors: Black, Navy, Pink, Red and True Royal. OGIO brand can only be sold with embellishment. Please contact us for pricing and details. The OGIO Big Dome Duffel is available to purchase in your choice of the following colors: Black, Navy, Pink, Red and True Royal. Bulk orders of 12 or more of the same product may qualify for discounts. If you would like to add your logo or personalize this product please contact us for services and pricing.